Mubychem Group, established in 1976, is the pioneer manufacturer of Potash Alum, Pharmaceutical, Fragrance & Flavor chemicals in India. Mubychem Group has several manufacturing facilities spread across Gujarat and Mumbai India and world wide contacts and toll manufacturers. We are exporting globally to countries like USA, Europe, UAE, South Africa, Tanzania, Kenya, Egypt, Nigeria, Uganda, Turkey, Mexico, Brazil, Chile, Argentina, Dubai Indonesia etc. 99.0 per cent to 100.5 per cent of AlK(SO4)2,12H2O. 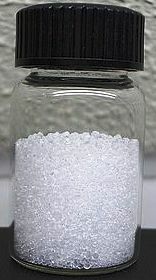 Granular powder or colourless, transparent, crystalline masses. Freely soluble in water, very soluble in boiling water, soluble in glycerol, practically insoluble in ethanol (96 per cent). Dissolve 2.5 g in water R and dilute to 50 ml with the same solvent. Packaging and storage— Preserve in tight containers, and store at room temperature. A: Add 1 N sodium hydroxide drop wise to a solution of it (1 in 20): a precipitate is formed that dissolves in an excess of the reagent. Ammonia is not evolved (distinction from Ammonium Alum). Loss on drying— Transfer 2.0 g, in a tarred porcelain crucible, to a muffle furnace at 200. Increase the temperature to 400 , and dry at 400 to constant weight. Cool in a desiccator, and weigh: it loses between 43.0% and 46.0% of its weight. Iron— Add 5 drops of potassium ferro-cyanide TS to 20 mL of a solution (1 in 150): no blue color is produced immediately.